Diamond Fun Casino have recently added a Giant Buzzer to help your party or special event be even more wacky and fun. Remember the electric buzzer wire we had so much fun playing as children at the fair, trying to negotiate a circular wand along a wiggly length of wire without touching it to make the buzzer sound? Our Giant Buzzer is like this but on a BIG scale. Our 10 foot long Giant Buzzer will be a huge hit at your event for adults and big kids alike. 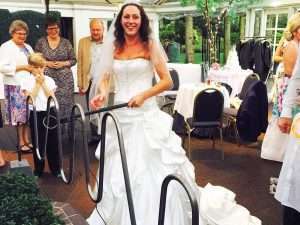 Using the hand held giant wand you and your guests need to move along without sounding the buzzer by touching the wire. Each attempt will be timed by our Buzzer Attendant and you can award prizes for the one who achieves the fastest time to the end. For those with a cruel streak you could also forfeit those who fail the quickest, use your imagination for the penalty! 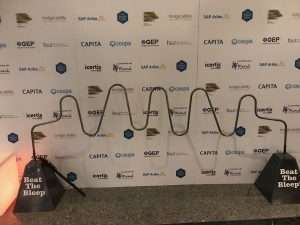 Team building events for businesses would also benefit from hiring our Giant Buzzer, our Buzzer Attendant will record team timings and notify you of the winning team at the close of the event. Our Giant Buzzer is available to hire for any event, birthday parties, weddings, bar mitzvahs, corporate events and more. 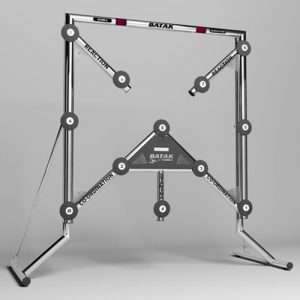 The Giant Buzzer specifications are 10ft long x 2ft deep x 4ft high and requires an operational area of 13ft x 8ft. Four players will take up their horse and ride it as fast as they can to see who will be first to the finish line. Each of the horses are different colours which correspond to their coloured horse electronically linked to the race track. There is an optional sound system which will commentate on the race & announce the winner, the winning horses light will also come on so it is clear who the winner is. The Vegas Gold Cup Horse Race game is suitable for any events either on its own as entertainment or in addition to our other services. Suitable for all players, this is a fun game to add a competitive edge to any event. The goal is to press the randomly illuminated buttons in as fast a time as possible. Different configurations & levels can be played. Times are recorded so that prizes can be awarded to the fastest players. Brand new for 2019 is our exciting Cash Grabber machine. 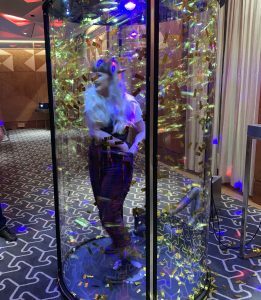 Reminiscent of classic tv programmes including the Crystal Maze and Noel’s House Party, you now have the opportunity of hiring the amazing Cash Grabber for your own event. Our Cash Grabber features the only floor to ceiling view curved cubicle made in the UK. With a strong base, steel framed door & finished in satin black with chrome trim it looks fantastic and is secure and sturdy.